It all began with a simple Facebook message and a coffee date. Years later during their annual tradition, visiting the Vivid lights in Sydney, Jack popped the question, “he proposed under the Harbour Bridge! It was so romantic and was completely Jack!” Bride Naomi said. 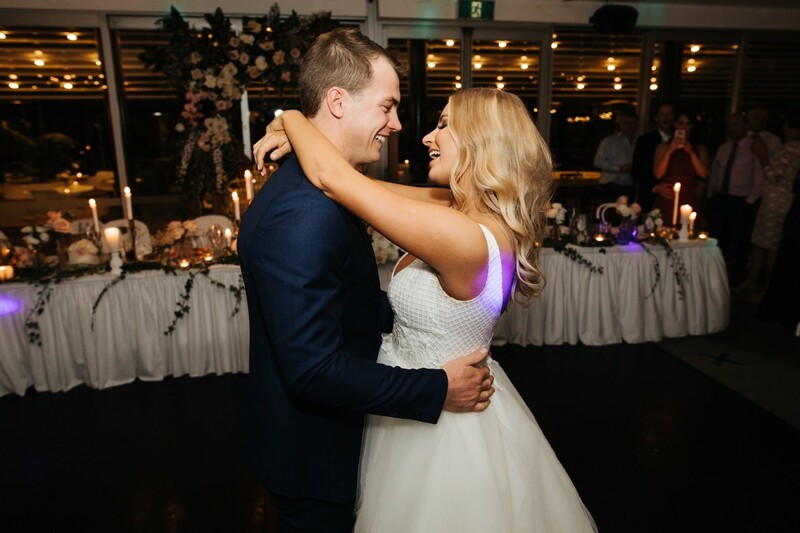 The Lagoon holds many intimate memories for Naomi and Jack; but that wasn’t the only reason they chose Lagoon for their big day. “We loved the use of the deck for canapés, it was a fun environment,” Naomi said. Naomi and Jack’s big day set off to a magical start. Their wedding was very relaxed and intimate. For décor Naomi and Jack chose an arbour, jute rugs for the aisle and the base of the arbour, and bentwood chairs. They also had a wedding sign, petal toss and flowers in pots on the opposite side. 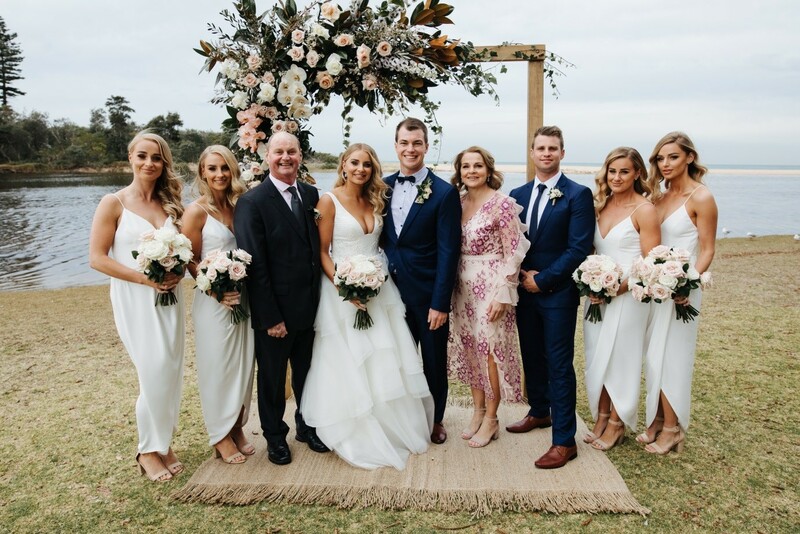 The couple opted for classic look with touches of gold and blush pink. The tables had a gold vase with blush pink and white flowers with orchids, roses and green foliage. Naomi and Jack also chose to add gold candle bases, white candles and 3 tea light candles in a glass. “I wanted to tie in with the gold lights that are new in the lagoon – I love them,” Zoe said. 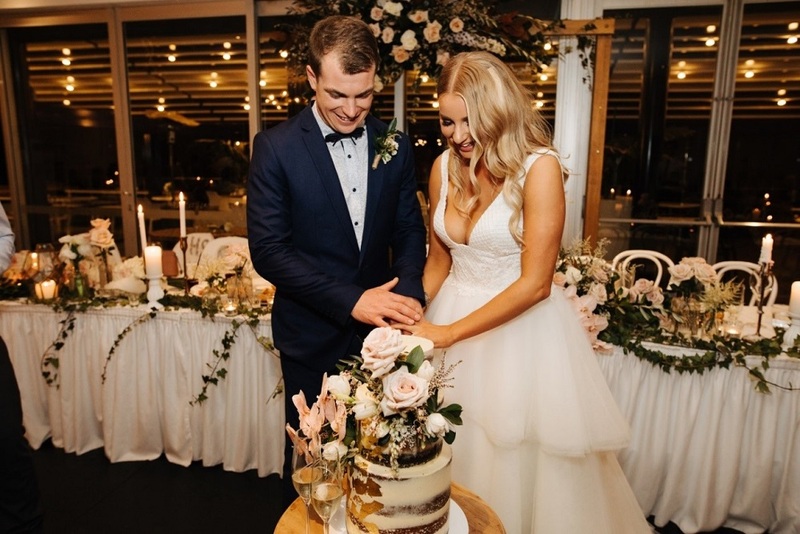 When it came to the reception dining, Jack particularly loved the King Island Chicken and the Caramel Panna Cotta, and still to this day Jack rates the Angus Beef Steak they had on their special day as the best they’ve ever had. “I also loved the cob loaf we had at the start of the night because I love balsamic and olive oil, the salt and pepper calamari was amazing!” Naomi said. For their first dance the couple chose Yellow by Coldplay, otherwise known as “their song”. The words have held a special meaning throughout the course of Naomi and Jack’s relationship. A magical day with a beautiful couple. Congratulations Naomi and Jack from all of the Lagoon team.